Aloe has been cultivated for human use for over 3,500 years, and for good reason: its medicinal benefits for the skin continue to remain unparalleled to this day. Climatically versatile and incredibly useful, aloe has been praised since ancient times for its ability to heal both inside and out. Unfortunately, aloe vera no longer grows naturally, so its true place of origin remains unknown. More recent times have seen the plant renaturalized to North Africa and the Saudi Arabian peninsula as it continues to be valued in both alternative and scientific medicine. Relieving burns and skin inflammation. Aloe applied to the skin is soothing, and it helps heal minor burns and wounds. Promoting bowel movements. Aloe leaf latex can be used sparingly as a stimulant laxative. The medicinal value of aloe can be traced back to its acetylated mannan content, a compound with antiviral and immunomodulatory properties. Scientific studies have shown that it causes activation of macrophages, which are a type white blood cells responsible to get rid of dead cells and harmful pathogens in infected areas. The juice from aloe's leaves contain salicylic acid, which is a keratolytic agent that improve cellular regeneration. 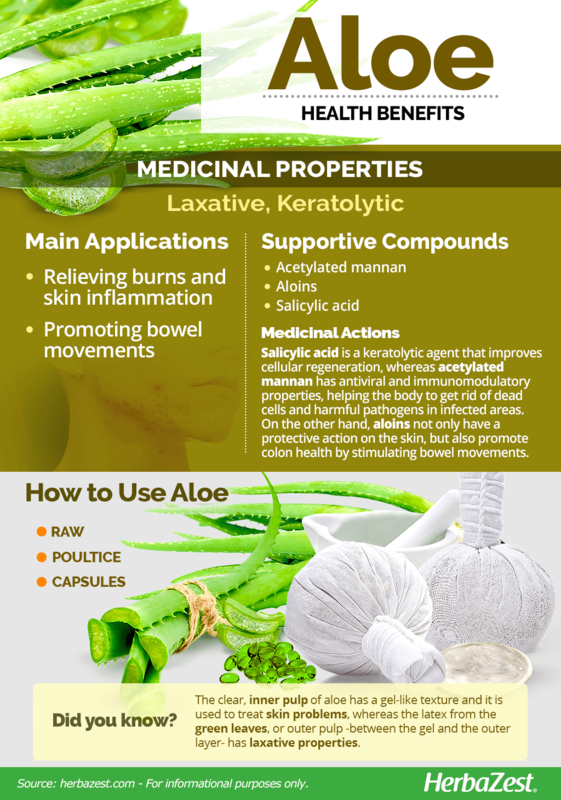 Additionally, aloins and other anthraquinones in aloe latex irritate the intestines, stopping the re-absorption of water and stimulating a bowel movement. More scientific research must be done in order to determine aloe's full nutritional value and toxicity. The active compounds in aloe have been shown to speed cell regeneration. Psyllium and tamarind also possess laxative properties, and similar skin healing benefits can be found in herbs like jojoba and gotu kola. Aloe gel is largely considered safe for topical application, and mostly safe for adult consumption. However, it may cause slight burning or itching on the skin of sensitive people. Aloe latex is considered unsafe, especially for those with intestinal conditions, hemorrhoids, or kidney problems. 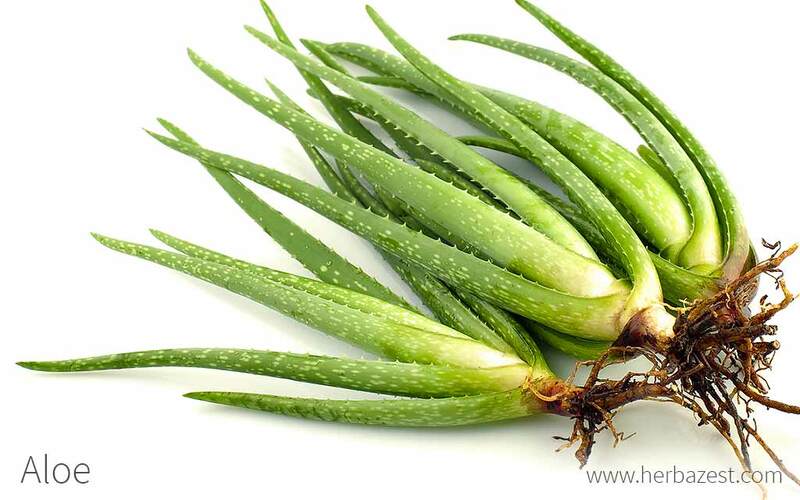 Children, breastfeeding women, and those with low blood sugar should avoid aloe. Pregnant women should not consume this plant, as it may induce miscarriage. Products containing aloe latex should not be consumed for extended periods, as the bowels can become dependent on them over time, they may disrupt potassium ion balance in the body, and anthraquinones have shown carcinogenic activity. The different parts of the aloe leaf vary in composition. The clear, inner pulp is has a gel-like texture and is used for skin ailments, while the green leaf latex, or outer pulp - which is found between the gel and the outer layer of the leaf - has laxative properties. Raw. The gel inside of aloe leaves, without the latex, is commonly added to some juices, yogurts, and smoothies to soothe ulcers, gastritis, and stomach discomfort. For constipation, adding the latex part of the leaves can produce a laxative effect. Poultice. When applied topically, aloe gel can help reduce pain and inflammation, as well as speed up wound healing. Capsules. Tablets and capsules are typically derived from aloe latex and sometimes the gel as well. They stimulate the intestines, producing a laxative effect. Aloe vera plants can be found at most garden stores, nurseries, and specialized greenhouses, thanks to their constant popularity as both a household and garden plant. They can be peeled by hand to obtain the nutritive and healing gel inside their leaves. The gel alone can be obtained at some health food stores and online, though many people find it easier to track down the plant and harvest it themselves. Aloe vera supplements can be found in certain health food stores. They are also readily available for online purchase, generally in gel capsule form. It is vital to do proper research on available brands, since efficacy is not guaranteed. Always follow product label instructions. A perennial succulent, aloe is notably tolerant of most climates and is capable of withstanding both droughts and poor soil quality. While aloe is a drought tolerant plant, for an optimal development it needs a good quantity of water, as roughly 95% of its structure is based on hydration. Full sunlight is also advisable, and if potted as a household plant, terracotta is the best choice of container thanks to its porous composition. Temperatures between 50 – 70°F (10 – 21°C) are ideal, although aloe can endure chills as low as 40°F (4°C). When the principal plant starts sprouting peripheral offshoots, it's time to transplant it to a larger receptacle. More detailed information about growing aloe can be found in the herb garden section. The aloe plant (Aloe vera) is classified as a succulent because it possesses fleshy leaves and stems with the capacity to store water and essential oils. The leaves of the aloe are composed of 95% water, and are thick, fleshy, and have jagged edges from base to tip. These leaves are usually gray-green in color, while the flowers are yellow and tubular. Each plant can reach up to 35 inches (90 cm) in height. A member of the Asphodeloideae subfamily, Aloe vera is commonly grouped with other ornamental plants that are found in northern Africa. The Aloe genus comprises about 250 species that grow worldwide. Only two of those species, however, have commercial value. This includes bitter aloe (Aloe ferox) - which is used as a laxative and to make the bitter tonics used in herbal medicine - and the most widely known species, Aloe (Aloe vera). Genetic evidence suggests that aloe first came from northern Africa, since other aloe species remain indigenous to that region. Documentation of aloe's use dates back 3,500 years to ancient Egypt, when it first traveled around the Mediterranean, across to Asia, and onward thanks to human cultivation. Early Egyptians also utilized the plant to make papyrus scrolls and to treat tuberculosis. Several centuries later, its healing powers remained in high demand as the Knights Templar included it in their "Elixir of Jerusalem," a herbal drink believed to lengthen life. Thanks to a global recognition of its healing powers, aloe is one of the most widely-grown medicinal plants in the world. It is cultivated via large-scale agricultural production by 12 countries for cosmetic purposes alone, including Australia, Cuba, China, Mexico, India, Jamaica, South Africa, and the U.S. Medicine, cosmetics, personal care, and other industries generate several millions of dollars every year by subsidizing aloe cultivation, not to mention the billions more that are made through product purchase. Cosmetic and personal care products, such as lotions, soaps, and tissue paper, frequently advertise the herb as a featured component. Additionally, the plant has proven to be a very effective fresh food and water preservative, and its seeds are currently being studied as a potential source of biofuel. It is also a popular houseplant.